Dr. Wren: I think you'll find that things have changed a great deal since your time. Ripley: Oh, I doubt that. The climactic events of Alien 3 appeared to end Ellen Ripley's battles with the ferocious alien enemies. However, through the magic of DNA technology, our heroine returns 200 years later as a cloned human-alien hybrid. Ripley possesses all the memories and knowledge of her original self, and doesn�t immediately realize the ramifications of the number eight tattooed on her arm. Her blood also sports some interesting properties, which raises questions about her allegiances. Scientists have cloned Ripley to gain access to the alien species in hopes of "domesticating" them: This idea is not very smart. Meanwhile, a group of tough mercenaries arrive on the large vessel with the cargo needed to create the aliens. Viewers will quickly realize that all hell is about the break loose, even given the scientist's apparently more responsible precautions. Alien: Resurrection faced lesser expectations following its predecessor's huge disappointment, and it actually provides a more original experience. French director Jean-Pierre Jeunet had achieved considerable acclaim for his previous two pictures�Delicatessen and City of Lost Children�but he remained an unknown to typical American audiences. His unique imagery evokes the spirit of these pictures while remaining grounded in the Alien universe. The gore quotient remains very high, but the tone becomes more enjoyable and less bleak. Writer Joss Whedon succeeded wonderfully with Buffy the Vampire Slayer and Angel, and the script reflects his less depressing style. Plenty of destruction still occurs, but it plays better as camp than as a serious science-fiction movie. Some missteps do happen, especially with the odd new alien at the finish, but Whedon does a solid job. Cinematographer Darius Khondji (Seven, Panic Room) injects considerable energy into the tale and brings a freshness to what could be generic material. The talented ensemble cast members aren't given much to do besides running from the aliens and spouting wisecracks, but they still help to create a believable atmosphere. Weaver remains very comfortable in this role and delivers an effective performance. Jeunet regulars Ron Perlman and Dominique Pinon both play their mercenary roles with impressive aplomb. Genre film staple Michael Wincott (Along Came a Spider, Strange Days) also does well playing the group's leader. One negative is Winona Ryder, who delivers a surprisingly flat performance that raises questions about casting the popular actress. I generally enjoy her work, but Ryder struggles here to generate chemistry with Weaver and sell her character's motivations. Once everyone is introduced and the expected calamity occurs, the characters spend the remaining time trying to escape the vessel. The aliens appear at inopportune times to wreak havoc, and a saboteur makes everything even more difficult. The best moment involves a tense chase through an underwater tunnel with the agile creatures pursuing closely. Upon arrival at the surface, our heroes face another shock that helps to create a spellbinding sequence. The other action scenes provide a mixed bag and waver between nasty violence and pure silliness. Ripley remains in control and helps with the escape, although one alternative excursion could doom them in the end. This tale moves briskly and provides an entertaining ride, but it lacks the truly memorable scenes of the first two pictures. Jeunet and Whedon make a game attempt to create a unique product, which is laudatory even though it doesn�t completely succeed. Alien: Resurrection may be viewed in either the original theatrical release version or a slightly extended special edition. The new scenes do add a few nice touches, but in general the overall result is the same. The major alterations include a different opening credits sequence that tries to be unique but doesn't work, and an impressive final shot that probably should have remained. Jeunet also adds a few lines and extends other scenes to reveal additional plot points. Both versions provide enough dark humor and memorable visuals to make this picture a worthwhile sequel. It's nice to see a slightly less serious approach to the material, especially following the gloomy predecessor. Jeunet, Whedon, and the entire cast deserve credit for generating a unique film that stands on its own while it connects all the way back to the original picture. Image Transfer Review: Alien: Resurrection utilizes a very clean 2.35:1 anamorphic widescreen transfer that ranks among the premier DVD releases. I spotted virtually zero defects or grainy moments, and the colors remain sharp and bright throughout the film. The more recent technology obviously gives this entry an advantage over the other three, and it shows within this impressive transfer. Audio Transfer Review: The atmospheric score and booming sound effects emanate well from both the DTS and Dolby Digital audio transfers included here. The rear speakers are used very effectively to generate tension during the water chase and bloody finale. The dialogue also springs clearly from all the speakers. This entire boxed set provides top-notch audio entertainment, and this film represents the most powerful example. Extras Review: Alien: Resurrection follows more closely to the first film and includes only a short collection of deleted scenes within the special edition. These scenes are viewable with a "Deleted Footage Marker" that makes it easy to see which ones are brand new. They also can be seen on their own in the theatrical version's section. Both cuts include another big commentary with Jean-Pierre Jeunet, various crew members, and enjoyable actors like Ron Perlman and Leland Orser. The director's involvement is especially welcome, and he openly describes his ideas for each scene. The crew members nicely provide the technical details, while the surprisingly intriguing cast members discuss their experiences. The documentaries and photo archives described below differ from those included with the other feature films mainly because the cast and crew seemed to enjoy their time on the set. They also focus more on the post-production than the past entries and include a smaller production area. The overall result is better than Alien 3 and provides some great material, especially concerning the nasty water sequence. Enjoy. Here we go again. Buffy and Angel creator Joss Whedon took over the screenplay and had to find a way to bring back the Ripley character. He discusses this immense challenge and his decision-making process to clone her. Producers David Giler and Walter Hill actually opposed the project and tried to halt its creation. We also get production interviews from Sigourney Weaver and Winona Ryder that are fairly promotional in nature. Completed on September 14, 1995, this first draft from Joss Whedon allows us to read through many pages of text to understand his initial concepts for the picture. This 13-minute featurette talks to the various cast members and Jeunet about their attachment to the picture. It covers talented actors like Leland Orser, Ron Perlman, Dominique Pinon, and Winona Ryder, as well as our heralded star. Jeunet and the others discuss the Ripley character and her importance to the series. They also describe the importance of camaraderie developing among the cast. The ADI guys shot test footage for the different alien types and human deaths prior to shooting. This feature allows us to view clips of this material, with optional commentary by Alec Gillis. These images are especially grisly and believable, even when removed from the actual scene. The second feature presents hair, makeup, costume, and movement tests with Sigourney Weaver. No commentary is available for these scenes. Artist Marc Caro had worked with Jean-Pierre Jeunet closely on Delicatessen and The City of Lost Children, bur he played a lesser role here. However, he did provide initial designs for many of the key characters, and they are offered in this section. These galleries present the original ideas for numerous art elements and Jeunet's storyboards crafted before shooting. The art sections cover designs for the ship, clones, aliens, props, costumes, and more. The storyboards present the cloning experiment, the aliens escaping, the Betty, and the human survivors. This 32-minute documentary presents the grueling underwater shooting, which delivers the film's most exciting sequence. Underwater cinematographer Peter Romano, Darius Khondji, and others discuss their involvement and the approach to shooting the complex footage. The result is intriguing and reveals the difficulty facing the actors and crew during several weeks of filming. Winona Ryder nearly drowned as a teenager, and hadn't gone underwater since that time, which made things very tense. Sigourney Weaver actually suffers from claustrophobia but overcame it to complete the sequence. It's even crazier to imagine Tom Woodruff swimming underwater in the massive alien suit. The fairly inconsequential basketball scene probably doesn't deserve its own featurette, but it should provide at least some mild interest. Weaver really wanted to hit the big shot herself, which caused some headaches for Jeunet and the crew. When she actually made it, Perlman and the others broke character in disbelief. This production gallery includes photos occurring throughout production, which include the ship's arrival the alien escape, and the underwater attack. It also contains shots of the key weapons used by the mercenaries. The second archive presents the A.D.I. Workshop crew's numerous models for the clones and aliens. We also observe pictures of Weaver throughout her life used to create the various ages of the cloned Ripley. Alec Gillis and Tom Woodruff, Jr. have worked on the Alien series throughout the last three pictures, and they've become experts on crafting the creatures. During this lengthy feature, they discuss the design changes of this film and the reasons for the changes. They aimed to make the creature even more cunning and vicious and seemed to crank up the slime factor. Updates were also made to the familiar facehugger and the alien eggs. We witness Weaver crawling among the nasty viper nest, which does not look very fun for her. Gillis and Woodruff, Jr. are especially candid throughout this box set and provide lots of interesting material. Composer John Frizzell had worked on few films prior to Alien: Resurrection, and getting hired for it was a big surprise. This 13-minute featurette talks to him and reveals his thoughts when scoring the picture. Frizzell incorporated elements of the first three movies while adding Jeunet's unique style. We observe him working with the orchestra and view a few key scenes while he discusses them. The original script actually contained storyboards across the entire left side of each page, which made it similar to a comic book. Visual effects supervisor Pitof worked with his team to discover whether CGI, miniatures, matte paintings, or other methods were needed for each specific element. New York's Blue Sky Studios was chosen for the CG effects because they did Joe's Apartment and its many cockroaches. Other companies also worked on it to hopefully get the best of each area. This compelling nine-minute piece reveals the tremendous work needed for even the shortest moments. I really like the use of miniatures, which often look much better than the technologically superior CG effects. All of the ships were done as miniatures, which works very well throughout the movie. The huge Auriga required lots of time to design, and Jeunet scrapped the original ideas very close to the end. Khondji also speaks about his idea for space and the lighting required to generate the proper atmosphere. This engaging documentary goes into impressive detail and speaks to all the key players. If the previous documentary wasn't enough to satisfy your curiosity, this visual effects gallery shows us many of the models described there. It's pretty extensive and probably not important to many viewers, but it's still a worthwhile inclusion. Reviews for Alien: Resurrection were mixed in the States, although they were better than its predecessor. Jeunet spoke little English, so he focused mostly on the French critics, who gave it top marks. This featurette follows the same mode and provides reactions from the familiar cast and crew. They are mostly proud of the picture even when facing the expectations of the first three films. Compared to the crazy productions of the last two pictures, it is refreshing to see a more amicable set. Crew members also discuss their varying hopes for the series' future. Producer David Giler concludes the documentary speaking about revisiting the events occurring before Alien, which is the most interesting concept in my opinion. Did you think we were finished? Well, not exactly. These promotional photos once again are a bit silly but are necessary to market the picture. So, after eight long discs, one remains. Shall we proceed to Disc Nine? In August of 2004, Alien vs. Predator will hit the theaters and probably anger many serious fans of the Alien franchise. 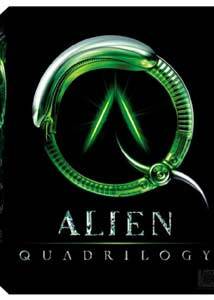 I doubt it will have even a shred of the horror elements originally contained in Ridley Scott's vision. Alien: Resurrection also frustrated some viewers with its odd humor amidst the grotesque imagery, but it makes sense given director Jean-Pierre Jeunet's style. While falling short of the first two pictures, this movie provides an entertaining ride and could bridge nicely into a fifth movie.